The art of snow activities requires plenty of strategic planning. But it often comes down to stamina. How long can you make snowballs or ski before your hands get too cold. 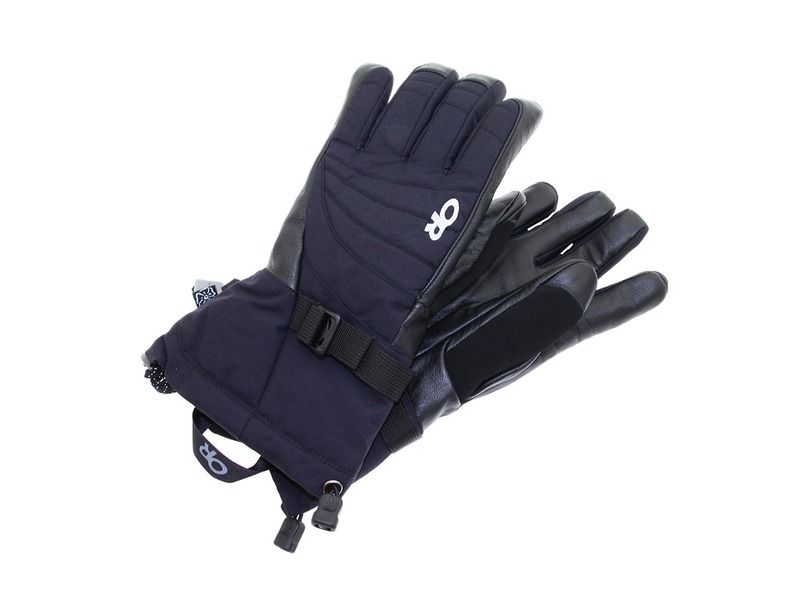 Take the upper hand with the ski Gloves, which will keep your fingers nice and toasty well into snow activities. Dakine&amp#174 collaborated with Wolfgang Nyvelt in the signature design of these gloves, which feature the unique colors, prints and graphics that reflect the Nyvelt~s personality and style. Weathershield&amp#8482 shell fabric repels water and is highly durable against the elements. Durathane&amp#8482 is a highly abrasion resistant, waterproof and comfortable palm material derived from a nylon substrate faced with polyurethane. Fixed mid-weight fleece lining. GORE-TEX&amp#174 insert provides the highest combined levels of waterproofing, breathability, durability and softness available while providing optimum comfort and protection. Pre-curved finger construction and roll-back finger design provides a comfortable, relaxed fit from the very first wearing. Convenient nose wipe thumb panels. Zippered cuff closure. Waterproof neoprene. Machine wash cold and hang dry. 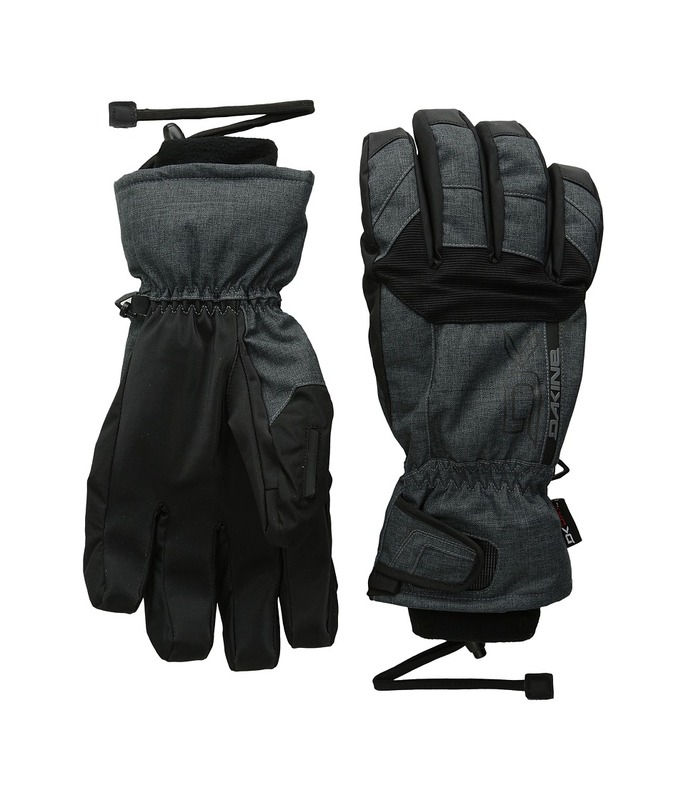 Don~t get caught up battling the cold and snow, protect yourself with the Crossfire Gloves by Dakine. A performance fit snowboard glove. 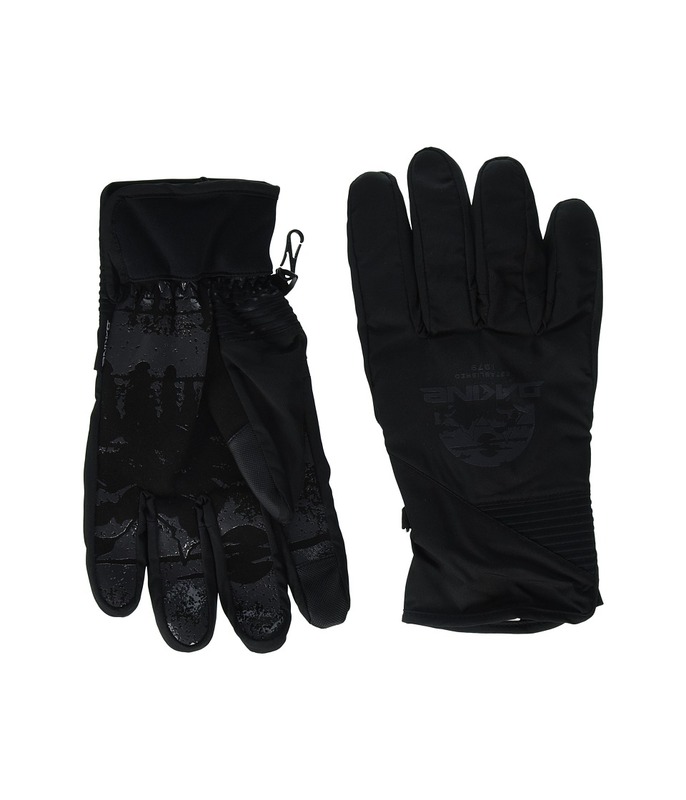 DWR (Durable Water Repellent) treatment keeps snow out of your gloves. Clarino synthetic suede palm for grip. Nose wipe panels on thumbs. Slip on style glove. Buckle at wrist for no-separation storage. Dakine logo at wrist. Materials: Shell: 83 percent polyamide, 8 percent neoprene, 6 percent polyurethane, 3 percent spandex. Palm: 60 percent polyamide, 40 percent polyurethane. Lining: 100 percent polyester. Machine wash cold, hang dry. Imported. Whether you are using them for some hard work or adding a little style for the upcoming season, the Basic Work Glove from Marmot will have you prepared for anything! DriClime Bi-component wicking lining for breathability and excellent moisture transfer. Falcon grip articulated for dexterity and ease of grip. Marmot logo at cuff. 100 percent pig leather. Lining: 100 percent polyester. Hand wash only. Imported. 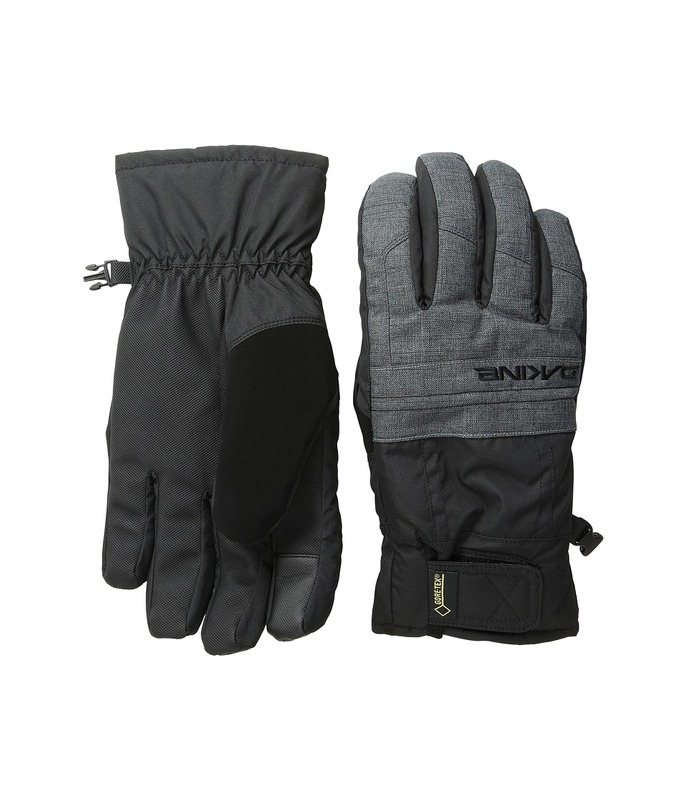 This ski glove has all the features and functions needed when hard-hitting snow storms roll in. Nylon shells feature waterproof, breathable Ventia &amp#174 inserts to keep your hands dependably dry and comfortable. 340g EnduraLoft &amp#8482 polyester insulation on the backs of the hands and 200g on the palms helps keep fingers warm while you play in the snow. Leather palms give a sure grip of ski poles and other mountain equipment. Soft patches on the backs of the thumbs give you a place to wipe your nose or clean goggles. The DuoCinch&amp#8482 gauntlet closures are easy to operate and seal out biting wind and snow wrist cinches fine-tune the fit across the back of your hand. Outdoor Research Revolution gloves include removable wrist cords that secure the gloves to wrists. Shell: Ventia. Palm: 100 percent leather. Insulation: [Back of hand] 340g [Palm] 200g. Machine wash separately in cold water and air dry. 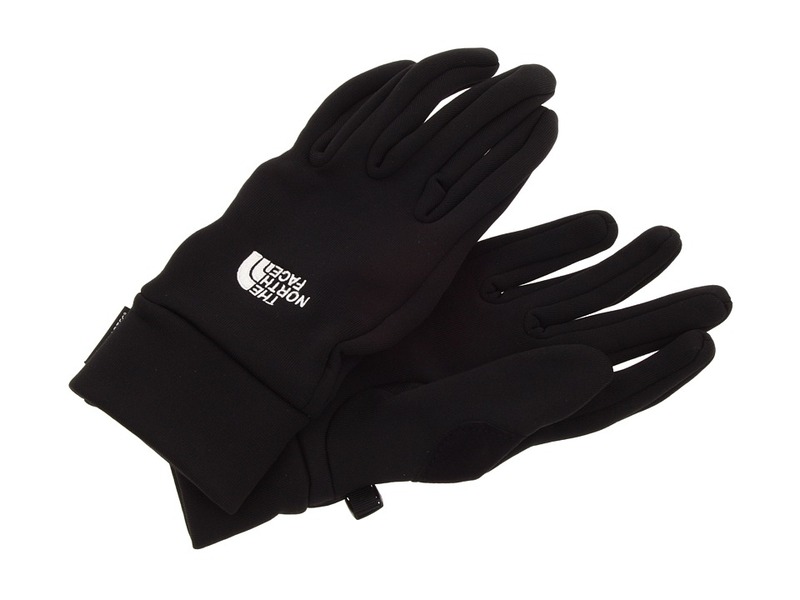 You~ll be killin~ it all season long with the versatile design and fresh features of the GORE-TEX Under Glove from Burton. Wear just the liner when shoveling, just the shell in sloppy spring conditions, or combine the two for midwinter warmth and comfort. For amplified warmth and versatility, nothing beats DRYRIDE Thermex four-way removable, stretch fleece liners. This unique, breathable and quick-drying fabric also accelerates the movement of heat-robbing moisture away from the skin and out through the shell fabric, keeping you dry from the inside out. GORE-TEX Waterproof/Breathable Glove Insert - Durably waterproof and breathable, the GORE-TEX insert is also completely windproof and incredibly lightweight, allowing your hands to stay warm, dry, and dexterous, no matter how nasty the weather becomes. Pistol Grip Pre-Curved Fit offers superior dexterity with its articulated fit, keeping your hands warm and nimble no matter what kind of action you run into. Thermacore Insulation offers mammoth warmth during the iciest season without smothering hands with mobility-limiting bulk. Sticky Icky Grip Palm offers a firm handle on anything you choose. If you grab it, you own it. 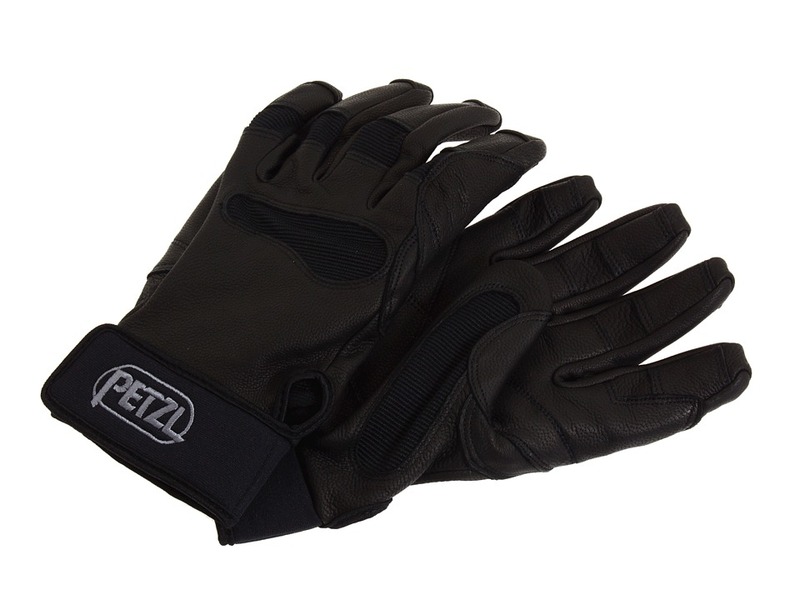 Ideal for sub zero riding, the GORE-TEX Under Glove offers serious warmth for the absolute coldest conditions. Lightweight, waterproof, and breathable, ToughGrip Palm excels in all conditions and performs even when wet. Brushed microfiber fixed lining. DRYRIDE Ultrashell two-layer coated fabric. Hidden vent pocket doubles as a slot to place disposable hand warmers. Hand wash, line dry. You~ll be killin~ it all season long with the versatile design and fresh features of the GORE-TEX Under Mitt from Burton. Wear just the liner when shoveling, just the shell in sloppy spring conditions, or combine the two for midwinter warmth and comfort. For amplified warmth and versatility, nothing beats DRYRIDE Thermex 4-way removable, stretch fleece liners. This unique, breathable and quick-drying fabric also accelerates the movement of heat-robbing moisture away from the skin and out through the shell fabric, keeping you dry from the inside out. GORE-TEX Waterproof/Breathable Glove Insert - Durably waterproof and breathable, the GORE-TEX insert is also completely windproof and incredibly lightweight, allowing your hands to stay warm, dry, and dexterous, no matter how nasty the weather becomes. Pistol Grip Pre-Curved Fit offers superior dexterity with its articulated fit, keeping your hands warm and nimble no matter what kind of action you run into. Thermacore Insulation offers mammoth warmth during the iciest season without smothering hands with mobility-limiting bulk. Ideal for sub zero riding, the GORE-TEX Under Mitt offers serious warmth for the absolute coldest conditions. Lightweight, waterproof, and breathable, ToughGrip Palm excels in all conditions and performs even when wet. Brushed microfiber fixed lining. DRYRIDE Ultrashell 2-layer coated fabric. Hidden vent pocket doubles as a slot to place disposable hand warmers. Hand wash, line dry. Create an invincible shield between you and the cold with the almost supernatural insulated power of the Dakine Titan Glove. 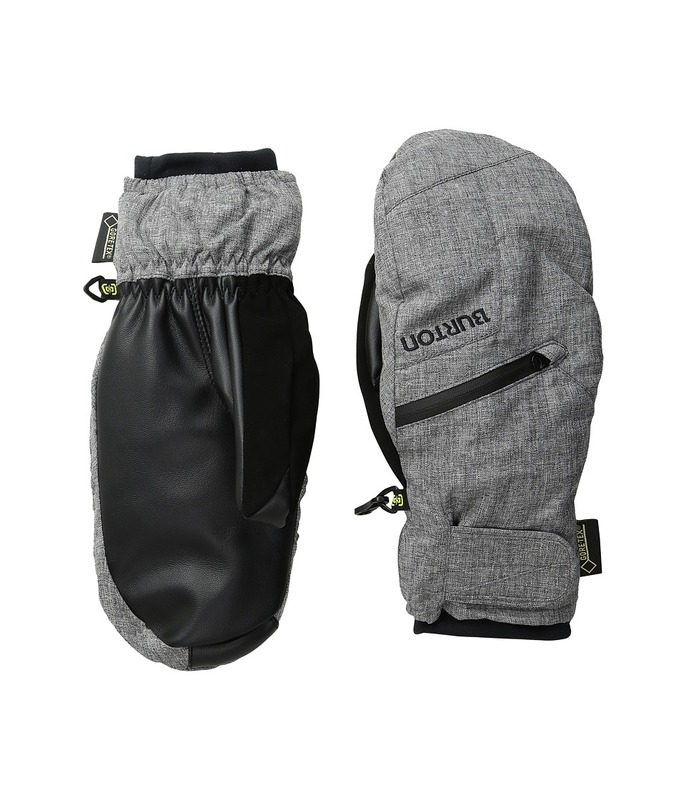 Insulated snow glove with an over the cuff design. The outer glove features Weathershield Flextough Corded Nylon, which is a high stretch fabric for added comfort and smooth range of motion. The fabric is treated on the surface with a Durable Water Repellent (DWR) finish and coated on the backside for additional water repellency and durability. RubberTec palm is a polyester substrate with a polymer based high grip surface treatment applied to it. In addition to being waterproof, it has excellent abrasion resistance for long lasting durability. Thermoloft is a synthetic insulation with an excellent balance of comfort, warmth and value. It resists moisture in wet conditions providing loft retention and an air space that holds heat and keeps hands warm. The non-bulky nature of this insulation allows breathability when conditions are warmer. GORE-TEX insert has the highest combined levels of waterproofing, breathability, durability and softness available while providing optimum comfort and protection. 150g Tricot lining is a lightweight material that provides incredible dexterity and moisture management without the bulk. One hand cinch strap at cuff for easy opening and closing. Nose and goggle wipe thumb panels. 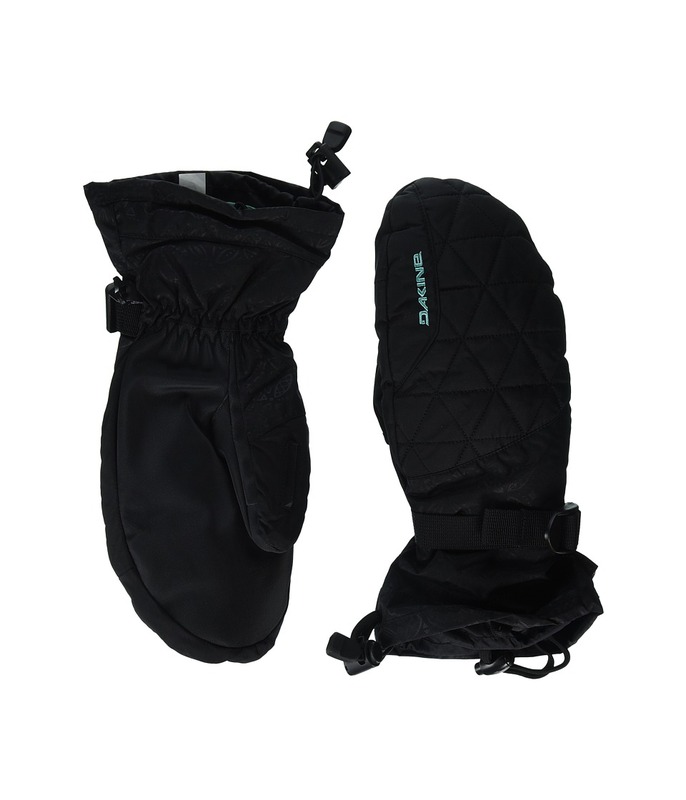 Removable 280g 4x4 stretch fleece liner glove included. External waterproof zippered stash pocket. Chamois goggle wipe is located at the zippered pocket next to the thumb. Materials: Shell: 95 percent polyamide, 5 percent polyurethane. Palm: 65 percent PVC, 35 percent cotton. Lining/insulation: 100 percent polyester. Wash cold with like colors, hang dry. Do not use powdered detergent, fabric softener or bleach. Do not iron, dry clean, machine dry. The powerful protection of the Dakine Titan Mitt will make you feel like you are as invincible as the mountain gods. Insulated snow mitt with an over the cuff design. The outer glove features Weathershield Nylon, which is a high stretch fabric for added comfort and smooth range of motion. The fabric is treated on the surface with a Durable Water Repellent (DWR) finish and coated on the backside for additional water repellency and durability. RubberTec palm is a polyester substrate with a polymer based high grip surface treatment applied to it. 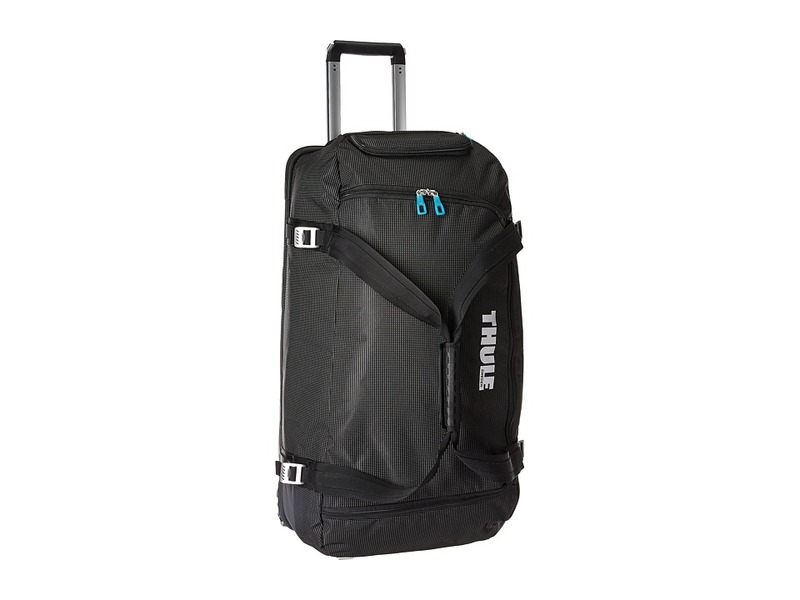 In addition to being waterproof, it has excellent abrasion resistance for long lasting durability. Thermoloft is a synthetic insulation with an excellent balance of comfort , warmth and value. It resists moisture in wet conditions providing loft retention and an air space that holds heat and keeps hands warm. The non-bulky nature of this insulation allows breathability when conditions are warmer. GORE-TEX insert has the highest combined levels of waterproofing, breathability, durability and softness available while providing optimum comfort and protection. 150g Tricot lining is a lightweight material that provides incredible dexterity and moisture management without the bulk. One hand cinch strap at cuff for easy opening and closing. Nose and goggle wipe thumb panels. 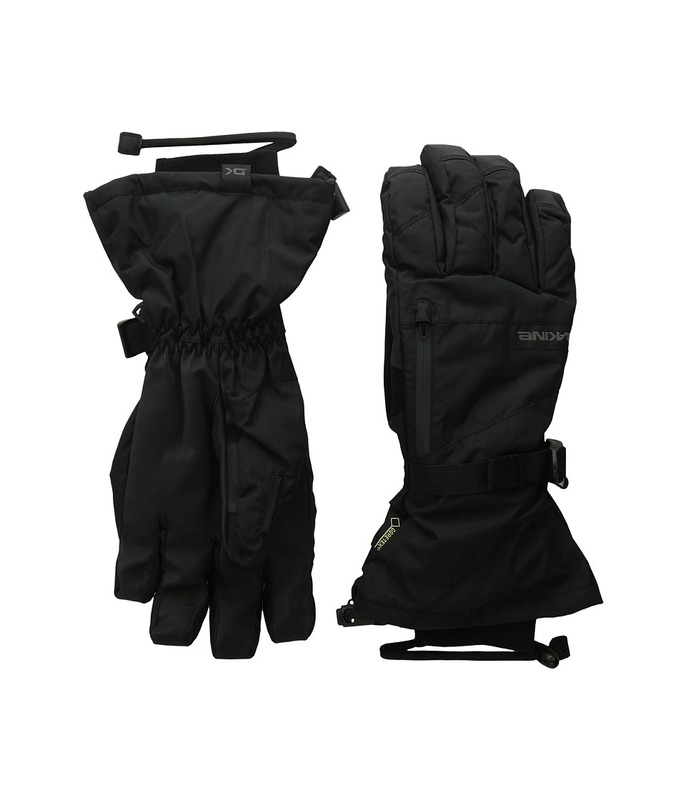 Removable 280g 4x4 stretch fleece liner glove included. External waterproof zippered stash pocket. Chamois goggle wipe is located at the zippered pocket next to the thumb. Materials: Shell: 95 percent polyamide, 5 percent polyurethane. Palm: 65 percent PVC, 35 percent cotton. Lining/insulation: 100 percent polyester. Wash cold with like colors, hang dry. Do not use powdered detergent, fabric softener or bleach. Do not iron, dry clean, machine dry. Head out to the backcountry for as long as you like the Dakine Scout Short Gloves will keep your hands toasty warm all day long. Insulated snow glove with over the cuff design. The outer glove features Weathershield Flextough Corded Nylon, which is a high stretch fabric for added comfort and smooth range of motion. The fabric is treated on the surface with a Durable Water Repellent (DWR) finish and coated on the backside for additional water repellency and durability. RubberTec&amp#8482 palm is a polyester substrate with a polymer based high grip surface treatment applied to it. In addition to being waterproof, it has excellent abrasion resistance for long lasting durability. Thermoloft is a synthetic insulation with an excellent balance of comfort, warmth and value. It resists moisture in wet conditions providing loft retention and an air space that holds heat and keeps hands warm. The non-bulky nature of this insulation allows breathability when conditions are warmer. Hipora waterproof insert uses a unique polyurethane film technology that maximizes value and comfort. It shuts out water from the outside, keeping hands warm and dry on the inside. 150g Tricot lining is a lightweight material that provides incredible dexterity and moisture management without the bulk. 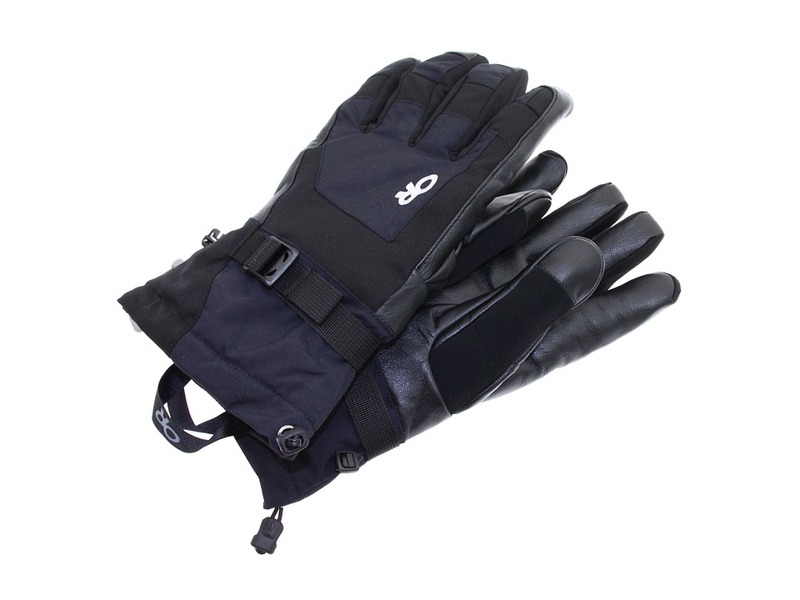 Removable 280g 4x4 stretch fleece liner glove included. Adjustable hook and loop closure. Nose and goggle wipe thumb panels. Materials: Shell: 96 percent polyamide, 3 percent polyurethane, 1 percent spandex. Palm: 65 percent PVC, 35 percent cotton. Lining/insulation: 100 percent polyester. Insert: 100 percent polyurethane. Wash cold with like colors, hang dry. Do not use powdered detergent, fabric softener or bleach. Do not iron, dry clean, machine dry. 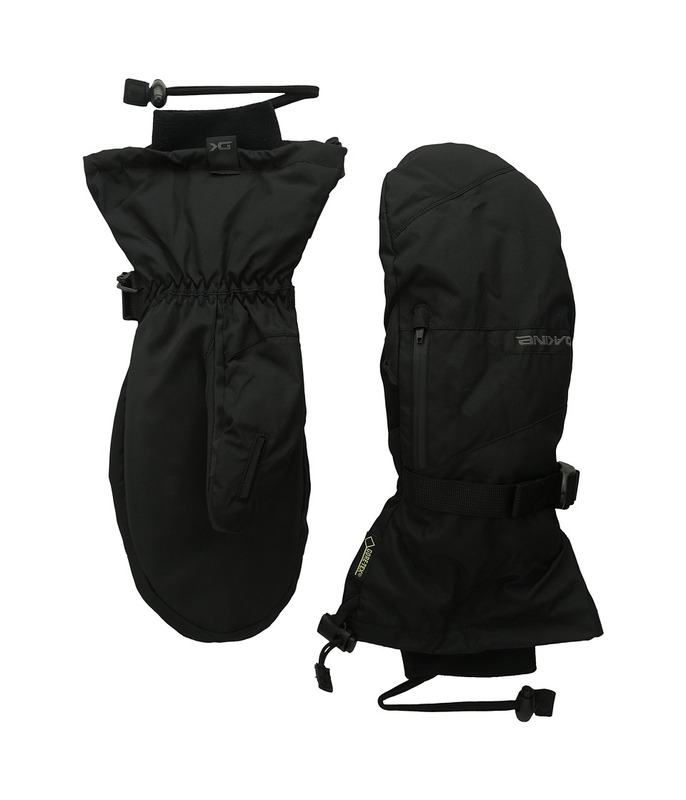 Do yourself a solid and prepare for the mountain by slipping on the Camino mitt from Dakine. Nylon-poly shell features DWR (Durable Water Repellent) treatment. Bungee closure at mitt helps keep the cold out. High loft synthetic insulation (Glove: 140/280 g Mitt: 210/350 g). Rubbertec palm for better grip. Nose wipe thumb panels. Internal heat pack pocket. 150 g tricot lining. 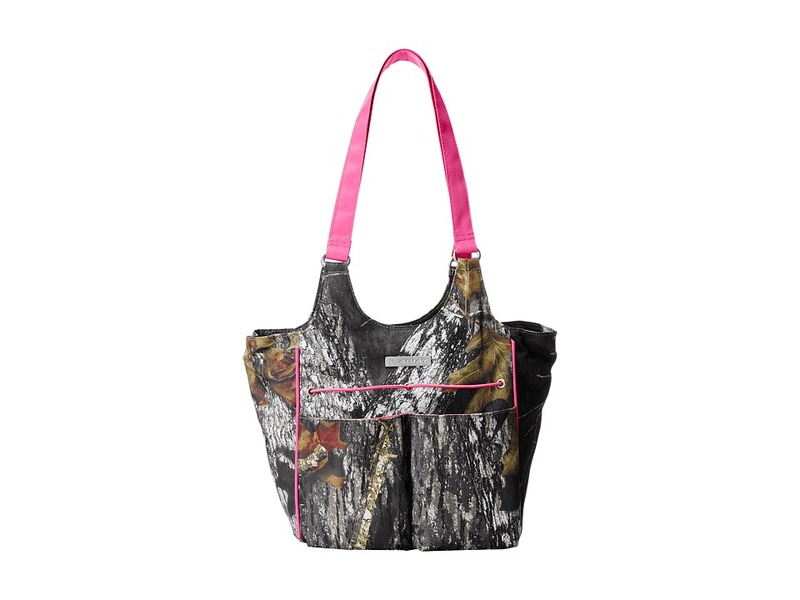 DK Dry waterproof insert keeps hands protected from outside elements. 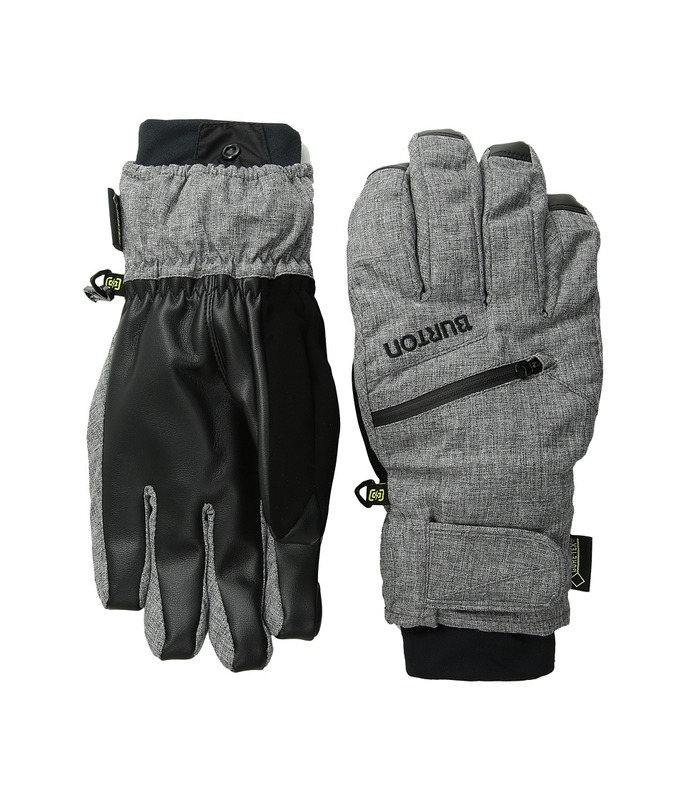 Removable, touch screen compatible storm liner glove is made from 280 g four-way stretch fleece. 43 percent polyester, 36 percent polyamide, 21 percent PVC. Machine wash cold, tumble dry low. Imported.